Absolute Insanity in Kalvesta, Kansas April 18, 2009... The video below shows all (8) tornadoes that touched down out of this AMAZING TORNADIC EVENT. Planning and positioning was really good for our team as we gathering strong facts toward our scientific research objective. A HUGE plus for SWS being close range to tornadic ground circulation getting measurements and data. (4) detailed scientific reports were done regarding data gathered out of this specific storm. INCREDIBLE CAPTURE BY JOHN HALLEN OF THIS ENTIRE STORM FROM INITIATION TO THE FINAL ROPE OUT OF THE LAST TORNADO... WITH NO OTHER STORM CHASER ACTIVITY IN MY POSITION. THE WEATHER CHANNEL'S "WEATHER CAUGHT ON CAMERA"This episode will air into mid 2011. A SPECIAL EPISODE ON WHAT HAPPENED ON THE SCENE THAT DAY WITH SWS JOHN HALLEN. AN EXCLUSIVE INTERVIEW, THE SWS PLANNING, AND SCIENTIFIC RESEARCH. A RARE TORNADO DESTRUCTION CAPTURE.. TUNE IN. This was our third day of storm interception the encounter was an absolute score for gathering some close range research. John got in really good position to get some hi-contrast tornadoes. Also witnessed a total destruction of a ranch property buildings with debris flying several hundred feet in the air. SWS John Hallen did an interview with the people that lived at the destroyed property.. A couple of news interviews were done on site. No one was injured in the destroyed ranch buildings. 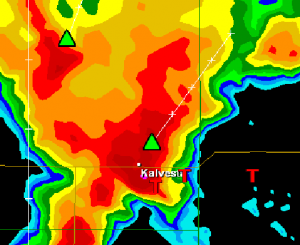 See the video below.. Insane footage of multiple touchdowns In Kalvesta, Kansas. CHECK OUT MORE VIDEO AND STUNNING SHOTS OF SWS STORM CAPTURES.. More videos of severe weather intercepts of all types on this channel. SCIENTIFIC RESEARCH, VEHICLE TESTING, CASE STUDIES. The tornadogenesis in action prior to the large tornado that hit the ranch. and the aftermath.. the reports.. and the radar. Shown here is what the hook echo looked like on radar as this was all going on.. and the final tornado reports for this chase day... notice the concentration of the reports in this southwestern Kansas event. NO UNAUTHORIZED USE OF VIDEO BY ANYONE WITHOUT PRIOR WRITTEN CONSENT AND ACCEPTANCE WILL BE PERMITTED.